There are very few today who would deny that the quality of our food has dropped, partly as a result of the change embodied by the death of the local shop and the rise of the supermarket. Where once the only change was that our food was pre-grown, now we find it has been pre-grown, pre-made, pre-cooked, pre-packaged, pre-distributed, and often find our purchases are precluded by lack of choice for good measure. Of course, supermarkets are the just one example of today’s monopolies, that much should be clear. Enter the store at one end, and you can start your purchases with your baby food at one end, and walk all the way through life till you need find a buy-one-get-one-free headstone and a “Value” lawyer to deal with your wills and probate. Plus the stores are so big these days that you might in fact need the coffin by the time you finally leave. Of course, the supermarkets can hide behind their names, disguising the fact that the economies of scale have destroyed the vagaries of the market and left us with these abominations. There may appear to be some jostling at the top, but the same essential products are on sale in essentially the same way in every one of their stores. Of course, the true competition goes on behind the scenes, out of sight of the consumer, to keep the prices down and keep the margins up. But the other competition goes by on the very shelves, as the supermarkets surreptitiously promote their own brand goods above third party offerings. Who can deny that the sliding scale of quality runs from Tesco “Value”, through Tesco “Finest” to the majority of third party products? Whilst their lower end products capture the price conscious element of the market, the better quality products attempt to undercut the price of the third party products whilst offering at least a competitive level of quality. That’s not to say this is a policy actually pursued by the chains, but it is certainly within their power to do so, and the fact that they can simply stop stocking third party brands makes such a goal all the easier to achieve. The problem is that whilst the supermarket has altered the way we buy food, it has also destroyed the competition and rivalry which kept food quality up. 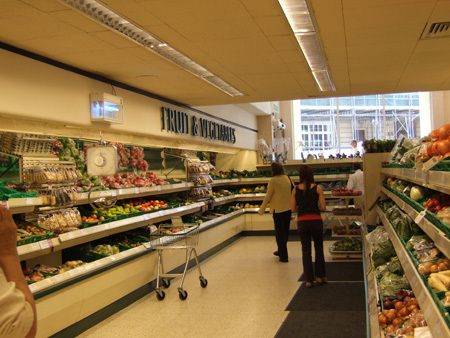 Whilst the corner shop has evolved and taken on a new role in the marketplace, backed by the big names of Spar or Londis, the butchers, bakers and greengrocers have been confined to those areas the supermarket cannot yet penetrate. Since this very basic competition is now out of the public sphere, it is little surprise that food quality has dropped over the years. What is needed is a true incarnation of the supermarket. It cannot be denied that the modern day supermarket provides many conveniences that critics often ignore. Convenient parking, bulk purchases, single transactions, a wider selection of food, competitive prices, are all benefits that the modern consumer will not give up for the sake of better produce. A true supermarket could and should, of course, maintain these benefits, by providing exactly the kind of infrastructure found in today’s behemoths. Everything from site maintenance and in-store facilities, to marketing and financing, through to storage and distribution, would all be handled by the overall supermarket organisation. The store itself, however, would comprise market stalls of all varieties, rented or leased to producers and distributors, organised exactly as might be found in a modern supermarket. Of course, such a layout would limit the scope of individual suppliers to sell a wide variety of products, but the consumer’s demands must be catered to if such a system were to compete with the established giants. Similarly, with today’s technology, a system could easily be established to allow all financial transactions to be made by the overarching supermarket edifice, skimming profits from the sales of individual retailers. Whilst more rural markets could integrate local producers akin to the farmers’ markets, the demands of the city would continue to rely on the methods of today. Yet even in the urban environment, consumers would be free to choose based not only on price, but on what they can physically see, smell, and should they be a regular customer, taste. Of course these rules could not apply to many items stocked in today’s stores, and perhaps these areas would be taken up by the supermarket edifice itself, but the space for competition in fruits, vegetables, meats, dairy, baked goods, preserves etc. is overwhelming. Potentially, of course, the supermarket could also serve to change food production patterns, as local producers bring their products to market locally, reducing the need for long distance deliveries and longer term storage, and contributing to a more environmentally friendly outlook. 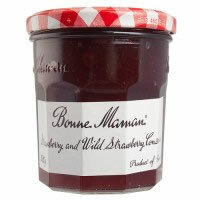 The success of a product such as Bonne Maman preserves to some extent illustrates the subconscious level of desire for high quality, locally produced foods. Their determined efforts to improve quality, and their deliberate marketing image replete with labels printed to resemble handwritten equivalents, and patchwork lid designs, have seen tremendous market gains in recent years. Ultimately, of course, the supermarket in its present form is here to stay, and having already cornered the food market, giants such as Tesco have already found their only avenues open for continued expansion lie in the non-food section. With food prices seemingly set to rise, after years of underpricing and the effects of the world’s burgeoning population starting to take effect in combination with the backlash against technological and intensive farming, it would appear that the supermarket focus on good value for money will continue to take priority over food quality, a fact we can only learn to accept, with no alternative in sight. With half the race gone, there is half the race still to go.